This is a unique and beautiful pair of wooden curved fitted Judaica candlesticks for Shabbat (the Jewish Sabbath holiday), painted with designs from Israeli artist Yair Emanuel. Modular in design and pleasing to the eye, these candlesticks make a wonderful gift or a fine addition to your home. When they're apart, they're two gorgeous works of art in the form of Shabbat candlesticks. When they’re fitted together, they form the image of a serenely beautiful pomegranate tree and a winding green vine. 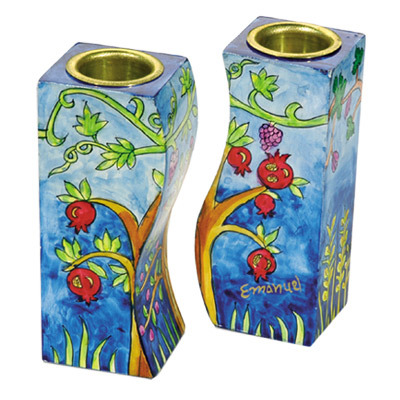 With their unique, curved and modular design, these twin wooden candlesticks - painted with the signed artwork of Yair Emanuel - are a beautiful addition to your Jewish observance and Shabbat celebrations. Designed for ease of storage and long-lasting beauty, you're bound to derive much enjoyment from this beautiful pair of Shabbat candlesticks. Shabbat (the Sabbath) is the Jewish Day of Rest, observed by Jewish people from Friday night through Saturday. In the Biblical story recounting the creation of the world, it is said that G-d formed the world from nothingness over the course of six days. On seventh day, He rested. Likewise, His creations rest from the mundane and materialistic trappings of the world on the seventh day of the week, for a day of prayer and celebration with one’s family.